This is the funkiest tape I believe I have ever received, and I of course mean that in a good way. Don’t misunderstand, this tape is rock and roll. )( somehow manages to be both in your face and laid back, frantic and soothing. Alex Ian Smith’s raspy falsetto is rivalled only by his excellent mix of guitar and bass. One thing I truly love about this tape is the synthesizer, we as music fans are at the beginning of a synth resurgence and I for one, am all for it. The synth on this tape is able to make me both nostalgic for the 80’s yet excite me for a future filled with jetpacks and shiny tracksuits. This album also showcases a talented drummer’s versatility with simplistic beats in the beginning to more complicated riffs in songs such as blinded by the blight. 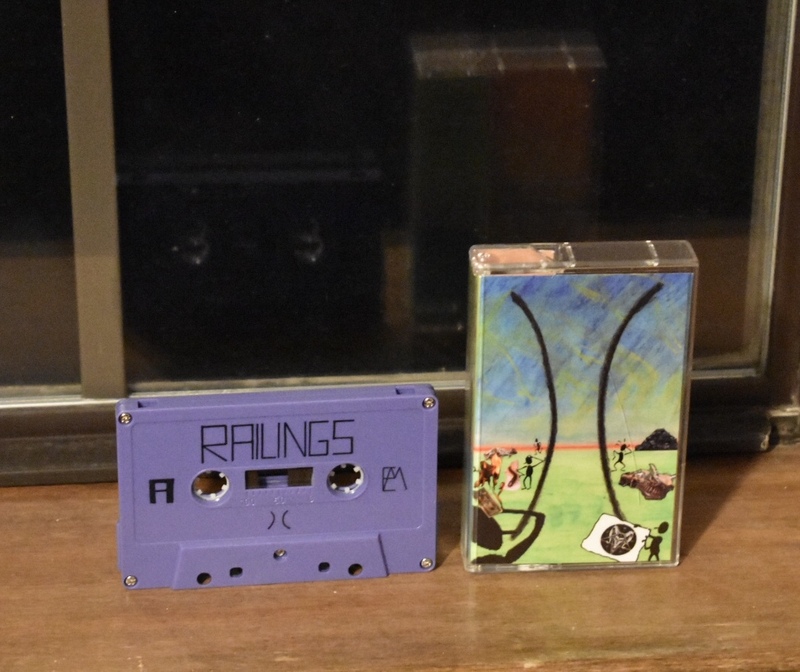 With this tape, Railings combines influences from jazz, pop, and many different walks of rock to create a new and different sound. This tape plays just as well in your bedroom as walking through the city. )( creates a psychedelic rock experience that you don’t need drugs to enjoy, but it couldn’t hurt. Give it a try, after hearing the first track (not to be confused with the song track one) Breaking the Bong cut through the silence, you’ll be hooked. This cassette also included on its B side a sampler of other Meta Errings artists, and I will certainly be checking out 8-tracks from everywhere along with a few others.